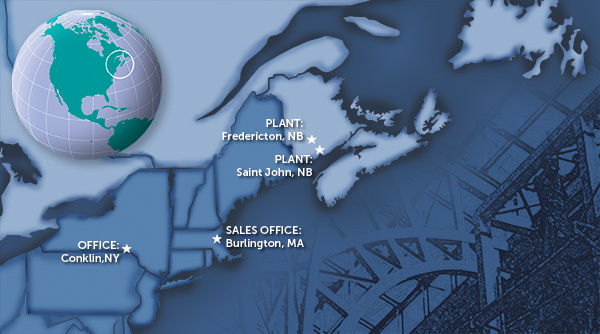 The OSCO Construction Group currently operates three structural steel plants, located in Saint John & Fredericton, New Brunswick, Canada; and in Conklin, New York, USA. Our total annual capacity is over 40,000 tons. This 120,000 square foot plant is serviced by over 1,100 linear feet of overhead crane-ways, with the ability to handle a single lift in excess of 50 tons. Our CNC shop fabrication machinery includes the latest state-of-the-art equipment used in the industry today. Our Production capacity is approximately 25,000 tons per year. This 53,000 square foot plant is serviced by overhead crane-ways, with the ability to handle a single lift in excess of 20 tons. Our Production capacity is approximately 8,000 tons per year. Our on-site Metal Service Center in Fredericton, New Brunswick allows us to obtain materials quickly to meet tight schedules.